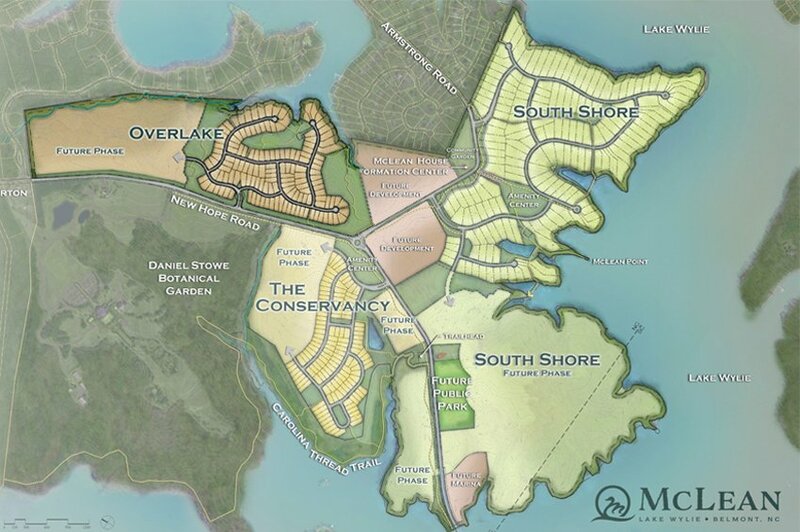 BELMONT, NC – Nov. 28, 2017 – Two prominent Charlotte builders will help launch the newest neighborhood in the master-planned waterfront community of McLean, on Lake Wylie in Belmont, NC. Shea Homes, one of the nation’s largest privately held home builders, and Evans Coghill Homes, the 2016 Builder of the Year in Charlotte, will start work soon on model homes at Overlake. Located on a quiet Lake Wylie Cove, Overlake will offer a variety of traditional single-family home choices in an active, outdoor-focused family oriented neighborhood. Shea Homes will build one- and two- story homes ranging from 2,090 to 2,900 square feet and having first- or second-floor owner’s suites. Home prices are expected to start in the low $300s. Evans Coghill Homes will feature bedrooms on the main level, guest suites, back porches, skylights, available built-ins and tile floors. Prices are expected to start in the mid $370s. Overlake will provide family-friendly amenities such as a pool/cabana and playgrounds for children, as well as numerous green spaces and an adjacent mountain biking trail. The popular Daniel Stowe Botanical Garden is directly across South New Hope Road from Overlake. Development of Overlake is progressing well. Most streets are in place, and many lots – including several waterfront lots on Lake Wylie – are ready for new homes. Shea Homes and Evans Coghill Homes expect to have their models open for visitors in spring 2018. Since 1968, Shea Homes, an independent member of the Shea Family of Companies, has built fine homes and master-planned communities for more than 100,000 families across America. The company is one of America’s largest privately held home builders, with new homes under way in 10 Charlotte-area communities as well as in the Greensboro area, California, Arizona, Colorado, Florida, Nevada, South Carolina and Washington. Evans Coghill Homes, a Charlotte-based home builder, grew out of a chance meeting of founders Alan Banks and Chris Folk Jr. while both were helping build a Habitat for Humanity Home in 2001. Alan Banks will serve as president of the 13,000-member NC Home Builders Association. Evans Coghill Homes is building in Riverwalk, Springfield, Cheval and, starting in 2018, McLean. McLean is taking shape along 5 miles of Lake Wylie shoreline in southern Belmont, NC. When completed, McLean will total more than 850 homes in three distinctly different neighborhoods: South Shore, The Conservancy and Overtake. The 670-acre McLean community being developed by NW Lake Wylie LLC encompasses much of the former estate of the Stowe family – pioneers in Gaston County’s textiles heritage. The master plan for McLean preserves the former estate’s best natural features for enjoyment by residents. More than 100 acres has been reserved for public parks, community ponds, residents’ clubs and walking trails. Several trails are marked and open to the public now, including the Seven Oaks Preserve nature trail beside The Conservancy.